Teaching your children about whom they can trust and whom they should avoid is an important part of safety education. Children can be very trusting. They are themselves innocent and have not yet developed a healthy sense of skepticism about the motives of others. “Stranger Danger” is the easy to remember term used to impart a sense of awareness about strangers. Teaching this skill is a delicate balancing act. You don’t want your child to come away with the impression that everyone is out to get them. This is not only psychologically straining for the child; it can also be dangerous. There are some instances in which seeking the help of a trusted stranger is exactly what is called for. Read more to learn about stranger danger. “Stranger danger” is a catchy little phrase that sums up the danger posed by strangers to children. When teaching your child about stranger danger, it is essential to make the distinction between “good” and “bad” strangers. Failing to do so could result in your child avoiding the people to whom they should turn to for help in the case of an emergency or dangerous situation. Tell them to keep away from strangers who approach them for any reason and to notify a trusted adult if this occurs. Teach your child to be skeptical of anyone asking for help finding a lost pet etc. There are very few legitimate reasons for a strange adult to initiate contact with a child. Children should be discouraged from accepting treats, candy or any other gift from strangers. It is vitally important that they understand that it is never okay to get in a car with a stranger. Teach your child that it is okay to say “no” to the request of a strange adult. Teach them to run, scream and notify other adults if a stranger grabs, pulls or tries to lure them into a car. It is also important to teach your child how to recognize a “good” stranger. Make sure that they understand that there are more good strangers than there are bad. Fireman, police officers, teachers, security guards and store personnel are all examples of good strangers that your child should turn to in the case of an emergency or when they are lost or in need of help. 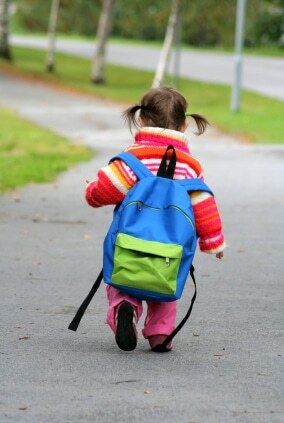 At Watch Me Grow North Las Vegas, we are dedicated to keeping your child safe. Our child care center makes use of video monitoring and our staff is regularly trained to respond to emergencies of all types. All Watch Me Grow staff are required to submit to an intensive FBI background check. The single entry check-in and check-out policy at Watch Me Grow ensures that your child cannot leave the campus unless both you, as the parent, and we, as the child care provider, are certain that they are in the right hands. If you are looking for a child care provider that provides quality programs in a safe and secure environment, Watch Me Grow North Las Vegas is the place for you! Come Check out our programs and contact us today!